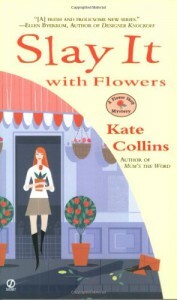 Slay It with Flowers - Kate Collins - review - What is Kimberly reading now? I shouldn't rate this so low because I read it after reading a book that was heavier in content and the characters weren't so, how should I say this, obnoxious. Come on! Cozy doesn't mean stupid and silly. I like to have fun just as much as the next person. But if a building is on fire, I know not to enter said building. Even Admiral Ackbar knew to turn away when he got to the Death Star and saw the Imperial forces waiting for him. Abby meddles to the point where she needs to be in jail. Why doesn't Marco encourage her to get a P.I. license instead of encouraging her to think like a P.I. then slap her wrist when she goes too far? To make matters worse, Abby's annoying cousin still isn't married by the end of this book. That means there's another book featuring Jillian. Should I bother with the next book?